Bucky Barnes: The Winter Soldier is one of the strangest books Marvel is publishing right now, following Captain America’s former sidekick on an intergalactic journey of self-discovery involving mind-altering drugs, alternate universes, and a dreamy romance with an alien queen. It’s firmly in line with the rest of writer Ales Kot’s work, which traffics in themes regarding war, violence, and identity (see this Comics Week Crosstalk for an in-depth look at Kot’s writing). But the cosmic setting and lush painted artwork by Marco Rudy give Bucky Barnes a flavor all its own. 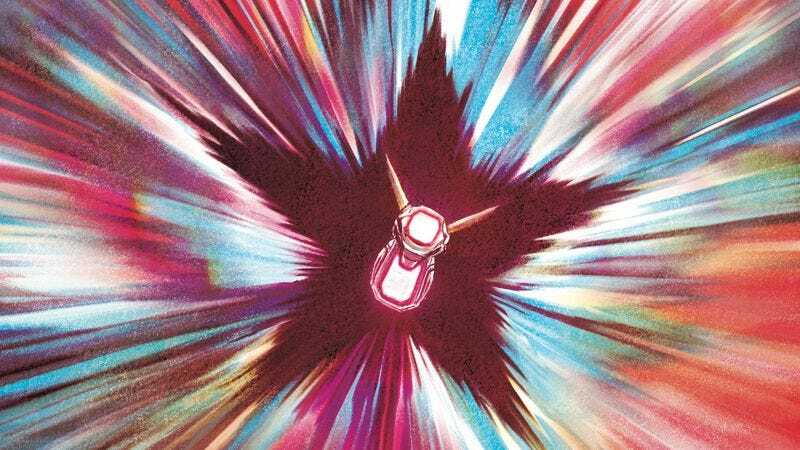 This preview of next week’s issue #10 spotlights both the sci-fi environment and the painted visuals, opening with a colorful splash page that makes it look like the Bucky is taking off into the cosmic unknown. The following two-page spread jumps back 30 minutes in time to show the Bucky of the present and future on the “gun-moon planetoid ‘Venter’”, and Rudy’s layout creates claustrophobic tension with shrinking circular panels showing the men making their way into Crossbones’ lair to save a friend. The sequence of circles also evokes the barrel of a gun, foreshadowing the action that lies ahead for these heroes when they come face-to-face with the villain. The combination of Kot’s idiosyncratic story with Rudy’s bold, experimental artwork has made this series a consistently captivating read, moving away from the Marvel superhero norm to deliver something exciting and fresh.